One of the unshakable tenets of regular, recognized Freemasonry is that it’s an organization for men only. Beginning in the mid-1800s, several groups for women related to Freemasons were created, with varying degrees of success. The Order of the Eastern Star (OES) was created to be a Masonic-style organization open to women, without simply being a copy, parody, or rip-off of the Masonic degrees. The ritual of the OES is similar in structure to the ceremonies of the Masonic lodge, yet different enough that it can’t be called a simple rewrite. The Order of the Eastern Star is open to men who are Master Masons and female relatives, spouses, and descendants of Master Masons. The Order’s teachings use characters from both the Old and New Testaments, and it is essentially a Christian-based organization, although non-Christians are certainly welcome to join. Like Freemasonry, only a belief in a Supreme Being is required. Adah: Adah is the first point; its color is blue, and its symbols are the sword and veil. Adah represents obedience and self-sacrifice. Ruth: Ruth is the second point; its color is yellow, and its symbol is a sheaf of wheat. Ruth represents the ideals of loyalty and friendship. Esther: Esther is the third star point; the color is white, and the symbol is a crown and scepter. Esther represents honor and courage. Martha: Martha is the fourth point; the color is green, and the emblem is a broken column. Martha represents devotion to the home, as well as a belief in the immortality of the soul. 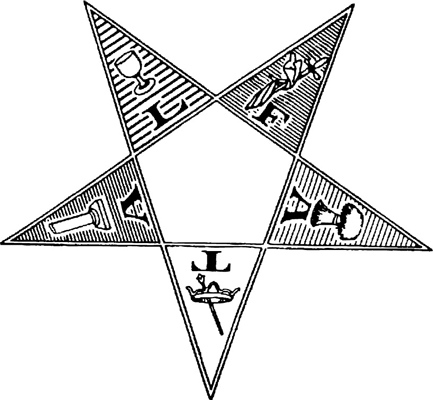 Electa: The fifth star point is Electa, named for the eklekte kuria, “the elect lady” of the Apostle John’s Second Epistle; the color is red, and the symbol is a cup. Electa represents the ideals of fervent love and faith. The symbol of the Order of the Amaranth is an amaranth wreath, with a crown and sword in the center. This order began in conjunction with the Order of the Eastern Star, but they have since become separate organizations. The original Order of Amarantha (founded in Sweden) had nothing to do with Freemasonry, but founder James Taylor was so impressed with what he read about it that he copied many of the symbols and terms he found — even the name. Despite its name, the International Order of the White Shrine of Jerusalem isn’t a whites-only group, nor is it affiliated with the Ancient Arabic Order of the Nobles of the Mystic Shrine. It is a completely independent group. It’s open to Master Masons and their female relatives, and it’s an overtly Christian organization. Members must profess a belief in Christianity and a willingness to defend it. White Shrine’s symbol is a star, a shepherd’s crook, and a cross, with the Latin motto, In Hoc Signo Spes Mea (“In This Sign Is My Hope”). Members refer to each other as Sojourners. The Social Order of the Beauceant (pronounced bo-see-ont) is unusual in American Masonry, because it doesn’t require or even admit men. It’s an organization of women limited to the wives and widows of Knights Templar. The Social Order was founded in Denver, Colorado, in 1890 as a support group for the local Templar Commandery, and the ladies never disbanded. They continued to meet to help their husbands and just to enjoy each other’s company. In 1913, they decided to change the name to something more templary, and decided on the Social Order of the Beauceant, using the same initials. Beauceant is a French term for the banner carried by groups of medieval knights.